Comments: Comments Off on Esto vir !!! 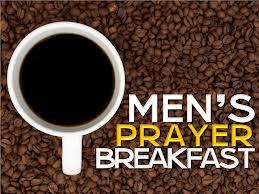 The Guardian of the Redeemer Catholic Men’s Fellowship will sponsor a Men’s Prayer Breakfast on Saturday, October 26th at Our Lady of Sorrows Hall (St Monica’s Parish) in West Wyoming. Capt. Joseph Mahoney USMC (Ret.) 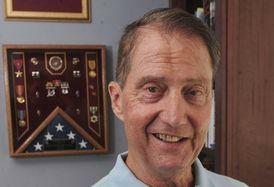 will speak about his ongoing efforts to assist the Catholic Church in Vietnam, which began during his tour of duty in 1968. The Prayer Breakfast will begin at 8:30 and conclude at 10:00. Doors will open at 8:00. There is no specific charge for the breakfast, but donations will be accepted. All men are most welcome, and are strongly encouraged to register by Thursday, October 24th. Please see this flyer for registration information. A group of Catholic men will be gathering on Thursday, August 22nd for an evening of prayer, formation, food and fellowship. The evening will begin at 6:30 at St Monica’s Church in West Wyoming where the men will pray the Glorious Mysteries of the Rosary in honor of the Queenship of Mary. The Rosary will be followed immediately by Mass. The men will then travel to Dino’s Italian Bistro in Shavertown. Pizza and beverages will be served. 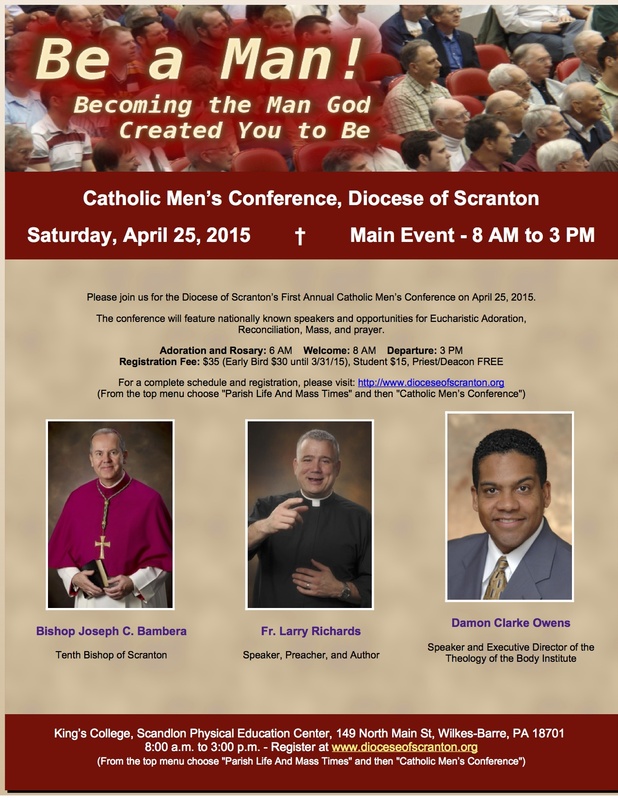 A video presentation entitled “The Man Talk” by Matt Fradd of Catholic Answers will be shown. In the talk, Matt Fradd lays out a vision of authentic Catholic masculinity and how to achieve it. This will be a great opportunity for fathers and sons to hear the truth together on some sensitive topics like sexual integrity and respect for women. The evening will end at 10:00. A free-will offering will be accepted to defray the cost of the refreshments. Expect an awesome night! Please email your registration (with the number of men attending) so we can plan how much pizza to order (email to Glenn at gmyanik [at] epix [dot] net). If you’re not sure you should make the effort to attend, perhaps this video will motivate you. 4:30 p.m. informative talk with various themes centered on the Sacred Heart of Jesus followed by exposition of the Blessed Sacrament, silent prayer, evening prayer, and benediction. All are welcome to attend any portion or all of these free events. Call 570-343-4065 with any questions. 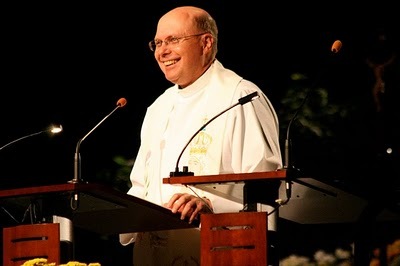 Fr Kubicki recently had a book published entitled A Heart on Fire: Rediscovering Devotion to the Sacred Heart of Jesus. He keeps a journal of his travels and ministry on his blog entitled “Offer It Up“. If you won’t be able to attend the retreat sessions, you can get a taste of Fr Kubicki’s teaching on the Sacred Heart of Jesus by listening to his presentation at a recent webinar hosted by Ave Maria Press. 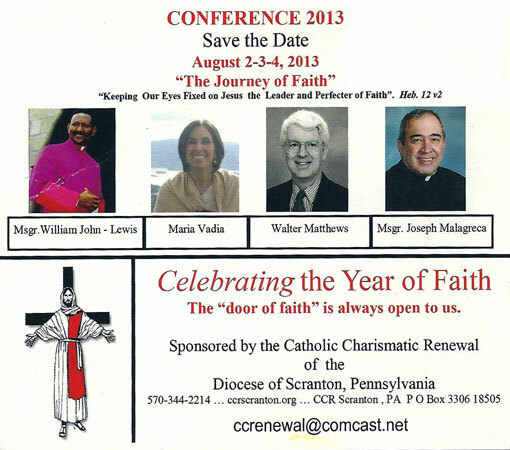 The deadline for the early-bird registration discount is July 18th. The registration forms can be found here.